Back from Switzerland, cinema bores, having my face ironed and a new book. Wotcha. I’m back from Narnia Switzerland. What a week. Skiing, shoe-shoeing, yoga, meditation, massages and so on. V spoiled. But am writing about it for Tatler so I can’t go into it all now. I have to say, though, if you’re after a traditional little village to stay in for a skiing holiday, instead of something wanky where oligarchs are busy spraying champagne over one another and skiing in Gucci onesies, Saas-Fee could be the answer. It’s a pretty place full of wooden chalets, 6,000ft up and about a 2.5 hour drive from Geneva. No cars. The only loud noise is the church bell. Raclette in every restaurant. Bliss. 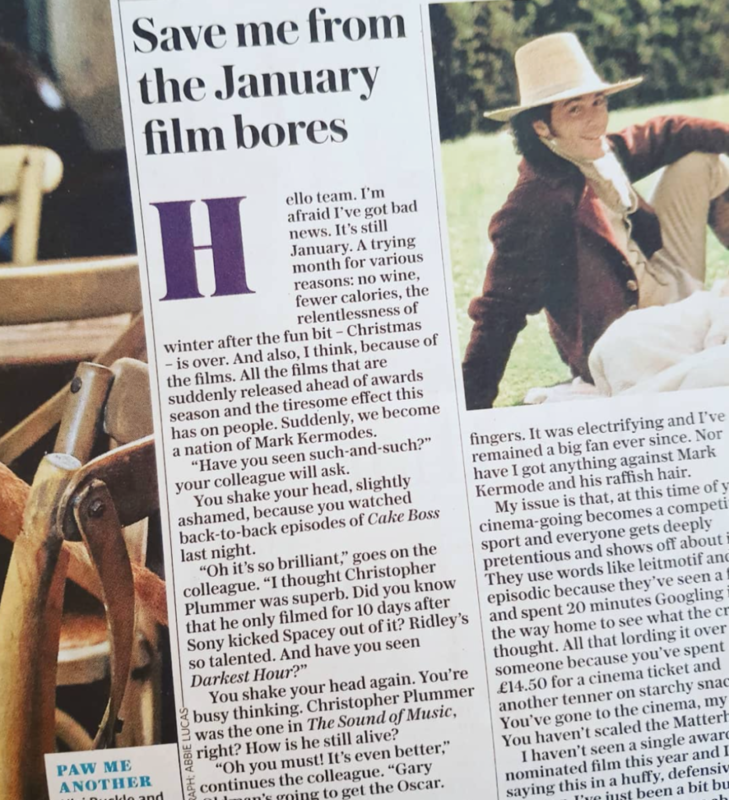 But now I’m back at my kitchen table so HERE is yesterday’s Sunday Telegraph column which is something I feel v strongly about. Oh and HERE is a link to a piece I wrote about a new £2,000 facial for The Sunday Times yesterday. I have an exciting cover interview and new project kicking off with Style mag this weekend but I can’t tell you who it is yet. You’ll have to wait for the weekend. Rotten luck. OH and while in Switzerland I finished Johann Hari’s new book about depression, called Lost Connections. Johann is a controversial figure (here’s an interview which Decca Aitkenhead did with him a couple of years back) and this book is causing a stir. I don’t know much about mental health, but – like increasing numbers of us – I’m interested in it. A few years ago when things were a bit blue, I went to my local GP and her first question was ‘Have you ever considered Prozac?’ I shook my head and said I wasn’t interested. I’m instinctively averse to chemicals, although I recognise for some people they may be life-saving. I was lucky. I wasn’t depressed, just having a rough patch which was improved by time, long runs and a therapist. And now if I’m having a day when everything feels heavy and I want to stay asleep, I take myself off for a two-hour march along the towpath instead. It’s like opening a window in my flat. The walk seems to blow unhelpful thoughts from my brain and out through my ear canal. Anyyyyyyyway, point being, Johann’s book explores this whole subject – how useful are antidepressants? Is our culture making us sick as opposed to faulty wiring in our heads? What changes can we make to help this, both collectively and individually etc. Some are busy decrying the book but I think it’s worth reading if you’re interested in the topic.